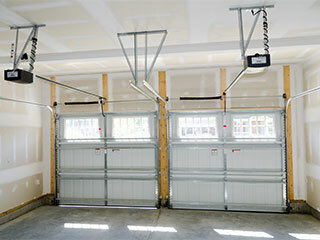 Buying the right garage door opener can be a daunting task for those with little knowledge about how they operate. Don’t blame yourself if the variety of options on the market makes you feel like you don’t know where to start. For homeowners, the main area of concern will be the drive type of the opener. The most popular openers on the market, chain drives, as their name suggests, use a chain mounted on a sprocket to lift and lower doors. They are readily available at an affordable price and are perfect for all those who are not too bothered with the loudness of their mechanism. If your bedroom is on the opposite end or your garage is detached from your house – in this case, this is the opener for you. What’s more, many models nowadays come with an upgraded chain separator which prevents the chain from hitting against the track, thus reducing the amount of noise. For a quieter operation, consider belt drive openers. They have been growing in popularity due to being as sturdy as chain drives but not as loud. These openers employ a rubber belt on a cog that opens and shuts the doors. Because there are no metal parts that create loud clanging, these models are a great alternative to chain drives. Some models will even come with a DC motor. Such units feature soft starts and stops which further reduce the noise, as well as wear and tear to the mechanism. Screw drives are often homeowner’s third go-to. These openers feature a long, moving, screw-shaped rod. Because such a mechanism only has a few moving parts, screw drives tend to be generally durable and reliable. However, these units tend to require more maintenance than their competitors, with the main task being the frequent lubrication of the interlocked components. For heavier, oversized, and one-piece doors, consider a screw drive as its inner workings won’t get torn and damaged after long and strenuous functioning. Are you in need of an opener installation or maintenance? Our dedicated team in Glendale offers a professional and competitively-priced service.